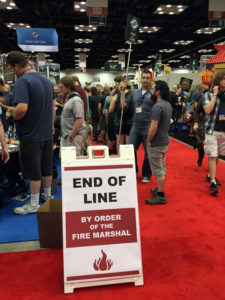 Today we finish up our annual Gen Con recap by taking one last look at the convention, and also give our suggestions for the future. If you missed our earlier coverage, you can read Part 1: The Games, and Part 2: The Convention Experience here. Tony – Manage the Growth of the Convention Better – Gen Con’s growth has been booming, and that’s both good and bad. The good is that it’s more money for publishers and the convention. The bad is for the attendees, as there is more competition for everything. Hotel registration is still a nightmare with people always ending up angry or disappointed. How about letting us book our hotel for next year on site? It’d be a good thank you to people who have been supporting the con for years. There were also lines everywhere: at will call, at the main hall, and even just to walk through the hallways. Gen Con needs to be more proactive in general about keeping up with the convention’s growth. Andrew – There needs to be a change on booking hotels: I was lucky enough to get a hotel downtown, but it involved all 5 of my gaming group buying badges separately so we could get 5 chances in the housing lottery. We set up all our laptops in the game room on hotel day and we all got very different places in line. If only one person bought all five badges (and only paid for shipping once) we would only get one chance in the housing lottery. It seems like more work for Gen Con to have to pack all the orders separately because they incentivize us to book that way. There isn’t a great fix for the whole housing problem – the number of rooms isn’t growing and the con is. But this particular “feature” just drives me insane. Brian Biewer (and Sarah) – ALL booths with heavy traffic need to be set up like Asmodee’s booth: It had one entrance and one exit. Staff monitored the entrance and let people in after customers completed their purchases and left the booth. It was not crowded once you got in there, unlike CMoN’s booth that had two entrances and were overrun within the first 20 minutes on Thursday. It also made me feel less rushed. I know FFG adopted a similar set-up, albeit it much longer and across multiple booth areas. Jeff Petersen – Reduced booth sizes and placement: I get it, you are a big publisher and you need a big booth, but do you need to be in the center of the hall? I think all of the big publishers should be moved to the edges / corners of the exhibit hall. Don’t worry, we will still find you and wait in line to buy your latest game, but your line won’t be clogging all of the other booths in the middle of the convention floor. Stephanie – More scheduled demos: At Z-Man, while waiting to demo Seafall Legacy, the demoer asked the players if they wanted to wrap up the demo or keep going. They kept going. <smh> Demos should be quick (15-20 minutes). Andrew says it best below: sometimes you feel like you have to muscle into a demo. A few years ago, Upper Deck started scheduled demos and Alex and I loved it. Only a few companies have followed suit (Asmodee, USAolopy come to mind) but more need to jump on board. Brian Winters – Bag-less and another swag-less year. This was the first year that I can remember that where there was no commemorative bag and another year of no swag bag. Badges are not inexpensive and you used to get some worthwhile freebies and a bag so you didn’t feel like you’re wearing a $95 piece of plastic around your neck. Sure you get the convention coupon book but you really had to hunt for freebies from the retailers. I had to stop by Crystal Caste and read their tiny index card, hand them my coupon book, and let them tear off the cover just to get my commemorative die this year. I just wish the GenCon team could provide the gamers some free stuff as they used to. Alex – Better use of ICC Space: I would like to see better use of the ICC for the administrative aspects of Gen Con, specifically Customer Service and Event Registration. That Wabash East hallway gets cramped and hot, and it does nothing but add to the general negativity of standing in line. I would like to see a quicker and easier way to get generics and event tickets on-site. Say I see there’s an empty ticket for an event I want to attend, that’s starting in an hour – I would rather have the ability to get that event ticket then show up with generics (or, worse, have to go buy generics) to be able to guarantee my spot. I don’t know all the logistics behind it, but I’d love to see an e-ticket system for events. Andrew (and Tony, Brian B, Walt) – Preorders: Seems like pre-ordering was an option for so many more games this year than last. Portal, Stronghold, CGE, Brain Games come to mind. I went into the convention hall knowing I could take my time and still leave with Cry Havoc, Ice Cool, Codenames: Pictures and I didn’t have to wait in an hour-long line just to see something get sold out. Heather – Super-sized demos: They are just more fun! Pretzel Games got this right. They had awesome demos of Junk Art and Flick ‘em Up. They were monster sized and truly attracted attention and added to the fun factor. This attracted tons of people to the booth and made playing the games a unique experience. This was an innovative marketing tactic and they really stuck out in the sea of games. Jeff Petersen – Scheduled demos: USAopoly had a lot of interest in their Harry Potter: Hogwarts Battle game. Instead of forcing people to stand around and hope to get into a demo at their booth, they created a sign-up list for all of the demos of the day. Of course that led to a major rush to get on the list, but at least you knew if you were getting to demo or not early in the day. Brian Winters – I’m with Jeff scheduled demos: It was almost like having a micro-event and something to plan your morning or afternoon around. I do still like the walk-ups but loath the waiting. Scheduled events are the best of both, but only if you can sign-up. Having more and better organization would help gamers want to play and pay for Publishers games. Alex – I love the preorder system, and wish that more companies would take this route. I am not holding my breath, though – limited availability means greater hype which means more buzz on social media and in the dealer hall. Tony – Make your demos better: Demos can make all the difference when it comes to sales. More than once I walked away from a booth because I either couldn’t get a demo, or the person working the both really did a poor job of explaining the game (enthusiasm helps!). Take a lesson from Fantasy Flight Games who as perfected the art of the demo. Set up your game in preset game states, play me through a few rounds and get me out of there. Nobody should be playing a full game (unless your game is really short). You want to churn through as many people as you can in your booth. Save the full games for ticketed events. I am still surprised I see people sitting at a booth for an hour playing a game. That’s many potential sales walking away from your booth. Andrew – Demo Lines: I hate waiting forever to demo a game at Gen Con. Publishers don’t have a good system to queue folks up, so often the pushiest folks can just grab a seat and get in. Some publishers have started requiring sign-ups for a particular time. I have mixed feelings about that approach as I was turned away from playing a game because all times for the day were full before noon. I’m sure throughout the day people didn’t return to demo at the appropriate time and I’m curious how they filled those slots. I don’t have a great solution for this but would like to see publishers exploring new ideas. I’m envisioning restaurant-like buzzers, but I’m sure that’s cost-prohibitive. Maybe a similar system that sends a text message? Brian Biewer – Booth construction: See above – more booths with a limited entrance and number of attendees so that you can shop without being pushed around. Heather- Booth Layout: I don’t agree with Brian that booths need to have limited entrances and exits. That only provides a barrier for entry, discourages people to enter and will ultimately limit sales. I saw many booths that were just poorly set up. Instead, publishers should view their spaces as mini-retail outlets and design them in a way that maximizes the square footage and increases sales. So please people, no hallways, make the merchandise accessible, show me what I’m buying (good displays) and let me demo games in a fun way. Demo areas should encourage people to get a feel for the game, but not encourage them to hang out for more than 15 minutes, churn those people through, get more hands on the games and make more money!!! Jeff Petersen – I am going to agree with Tony and Heather: We just want a taste of your game, not a long two hour demo. Preset the game and run through a turn or two. Simplify the rules if necessary, and just let us know that you are doing it. Brian Winters – Have our Backs: Have kickstarter base games available to your backers as well as for retail. I would have no issue if CMoN send out a KS update to that effect. It might get me in their booth and possibly buy something else like say, Potion Explosion, instead of complaining and brooding for the better part of two days. KS publishers send out questionnaires and surveys all the time so why not include this question: Will you be at Gen Con and would you like to pick-up a copy of the base game you helped paid to get published? Answer is yes! Alex – I would like to the publishers with hot games schedule their demos: – I realize that this requires some time investment and someone on booth staff to coordinate. I also know that some publishers already do this in the form of ticketed demos (which I am not a fan of – what if I play through 2 rounds and I do not like the game? I’m out of my time and money investiture.) I also would like to see publishers set time limits on demos. I’m going to call out Plaid Hat Games on this – I was standing with a group waiting for a demo of Seafall, and two of the players complained to the guy running the demo they wanted to continue because they wanted to be able to accomplish something…so they got to start *another* round. There has to be some consideration for getting people moving in and out of the demo tables. And that wraps up our coverage of the Gen Con 2016 gaming convention. We had a great time this year and are eagerly awaiting next years “Best 4 Days in Gaming”, even if it is later than usual.